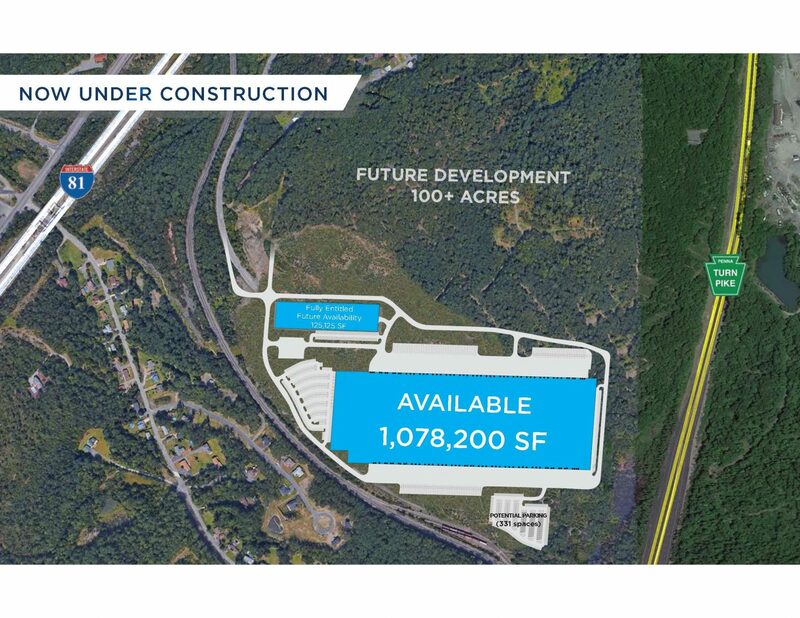 Affiliates of Endurance Real Estate Group, LLC (“Endurance”) and Blue Vista Capital (“Blue Vista”) announced today both the closing of a construction loan with Square Mile Capital Management LLC and the commencement of construction of a 1,078,200 SF Class A bulk distribution building located at 140 Industrial Drive in Pittston, Pennsylvania (“Interstate Distribution Center”). Ryan Ade of Holliday Fenoglio Fowler, L.P., represented Endurance in this transaction. Interstate Distribution Center (“IDC”) is an impressive 225 acre development located in the heart of the I-81 Corridor industrial submarket. The project is located at the confluence of Interstates I-81 and I-476 (PA Turnpike) in Pittston, which offers direct access to those major arteries as well as Interstates 80, 84 and 380. Endurance and Blue Vista purchased the IDC site in 2012, which at the time contained over 1MM SF of existing manufacturing and distribution space and was 50% leased. Endurance pursued approvals to demolish the existing structures on the site and transform the site into a modern bulk warehouse/distribution park. Endurance was recently granted approval from Jenkins Township to proceed with the first phase of their development plan, which includes the construction of the 1,078,200 SF building and an additional 125,125 SF building, the latter of which is currently being marketed on a built-to-suit basis. The second phase of development includes a third building on the northern part of the site anticipated to be around 500,000 SF. “The Eastern Pennsylvania industrial market, particularly the NEPA submarket, continues to see increased demand for state of the art distribution buildings from end users” stated Ben Cohen, President of Endurance. “Our decision to go spec with a 40’ clear building should be well received in the marketplace given the historically low vacancy rates and known timetable for delivery”. According to Cushman & Wakefield, the NEPA submarket reported an overall vacancy rate of 3.6% for the period ending the third quarter 2018 and has recorded almost 1.7 MSF of year-to-date net absorption. David Erlbaum, Vice President of Development, added “IDC should be very well received from a logistics standpoint for e-commerce and other distribution users due to its location, however the site’s historical infrastructure as a result of it’s prior manufacturing operations really distinguishes it from its competitors.” IDC has significant in place utilities including a 69 KV substation fed by two separate grids, 10” water and sewer mains, ample gas service capacity, and Class 1 rail infrastructure adjacent to the site. Founded in 2002, Endurance is a Radnor, Pennsylvania-based real estate owner/developer focused on income and value creation opportunities in the Mid-Atlantic region with a concentration in office and regional and bulk warehouse/distribution assets. During Endurance’s history the company has acquired $500MM of assets totaling over 10 MSF. Endurance’s current portfolio consists of 3.8 million square feet of warehouse/distribution, flex, and office assets. Affiliates of Endurance have closed on eight (8) separate transactions over the last 3 years, totaling over 2.4 million square feet of warehouse, distribution, and flex space. For additional information on Endurance, please visit our web page at www.endurance-re.com and follow us on Twitter @EnduranceREGrp. Blue Vista ( www.bluevistallc.com) is a leading investment management firm focused on helping investors maximize returns through best-in-class real estate strategies in student housing, middle market equity and middle market lending. Blue Vista offers investors the benefits of a vertically integrated platform, complementary strategies managed by experienced teams, and deep expertise as an owner, operator and lender. Since its inception in 2002, the firm has invested over $7.5 billion in total capitalization, with the goal of challenging the status quo, setting high standards and bringing a relationship-based, client-focused approach to real estate investing. Square Mile Capital Management LLC is an integrated institutional real estate and investment management firm based in New York. The firm’s commercial real estate debt platform provides customized capital solutions for real estate owners and developers throughout the United States. Square Mile Capital’s opportunistic equity platform takes a value-oriented approach to its investment activities, with an emphasis on opportunities to acquire or capitalize real estate assets or enterprises that are undervalued, complex or under-capitalized.